In order for you to understand the interview the translated transcript of which will appear below, I need to tell you something that happened many years ago. In an attempt to get rid of my flab, I started going to the gym with M for several weeks just so I could observe what exactly he did to achieve the kind of physique he had (and still does). I’d noticed that M always began with upper-body weight machines. Then he moved on to either a cardio then lower-body workout or vice versa. It was the same sequence every single time. Finally, I asked him to enlighten me on his workout method. With M’s personality established, here’s the translated transcript of the pertinent part of my Pulitzer-worthy Skype interview. Leela: (Brain cells are now dying in droves.) So you like pineapple? Leela: And you, uh, also like Nam Prik Pao? Leela: Like — a lot? Leela: So why did you use brown rice? M: My wife made me. M: (Yelling to his 3-year-old in the background.) I said, DON’T PEE ON THE DOG! M: Huh? Oh, sorry. (Continued yelling.) Fine! Go do it outside! Leela: Um, M. What about shrimp? You’ve been using nothing but shrimp. Never pork. Never beef. Never chicken. Never squid. Is it also because it’s there? So there you have it, folks — the background information on this fried rice, straight from the horse’s mouth. I hope this has been enlightening and helpful. Heat the vegetable oil in a large skillet set over medium-high heat. Once the oil is hot, add the onion dice; stir until soft and almost translucent. 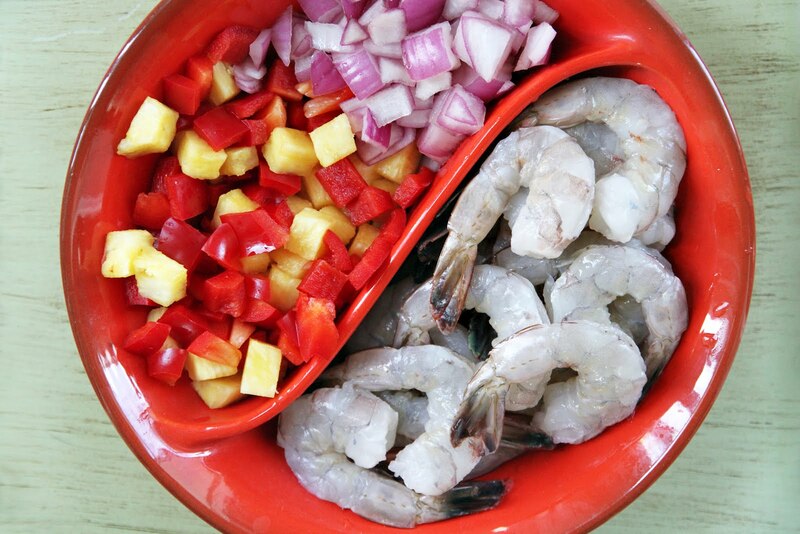 Add the shrimp, Nam Prik Pao, and red bell pepper dice to the pan; stir until the shrimp is almost cooked through. Add the rice and pineapple to the pan, followed by the fish sauce; stir to heat everything through and get the seasoning to coat the rice. Remove from heat. 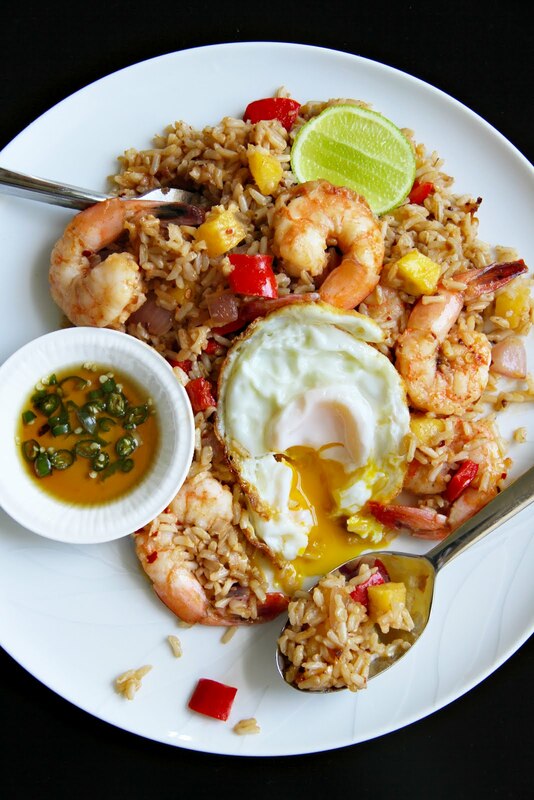 Serve with a bowl of lime-heavy (especially if you use commercial Nam Prik Pao as it can make the fried rice a bit too sweet Nam-Pla Prik (and fried eggs, if desired). HAHAHAHAHA. Your friend M is my kind of cook! And the fried rice sounds delicious! Especially with the addition of the fried egg. I just love it! Can’t wait to go to Thailand. Hilarious. Reminds me of trying to interview the Ramones back in my college days, in 1979. Gaaaaah! I’ve been a follower of your blog for several months but never felt moved to comment, until today….. Very creative and funny post! I love the “Don’t pee on the dog!” line. And I’m thinking, I just may try making this rice this afternoon since I already have everything needed(including a fresh pineapple)in my kitchen. Thanks!! HAHAHA great story. I love how this dish looks. it reminds me of a favourite from home, nasi goreng! esp with that fried egg on top, crispy at the edges and with a runny yolk! Yum! Reading about this friend rice is making me hungry! Love the combination of sweet and savory flavours! It sounds like he can cook an amazing fried rice even if he can’t explain why. I loved the contrast between the preferred answers and the real ones! I’m thinking about substituting chicken breast for the shrimp since that’s what I have on hand. Anything I should do differently besides just swapping the proteins? Eric – Nope. I’d cut the chicken into pieces the same size as the shrimp, so they cook at the same rate. I made this last week and loved it! I really enjoyed the mixture of flavors (although I’m not well-practiced at frying eggs, so that part wasn’t so pretty). I’m so glad that you advised serving with nam-pla prik — since the dish itself isn’t too hot, the nam-pla prik is a great way to let the heat lovers spice it up more. I also made your nam prik pao with asparagus and was thinking about doing a little combo. I am planning to cut the asparagus into ~1.5 inch pieces and then add to this dish. Any reasons why that might go wrong? And if I don’t blanch or steam the asparagus ahead of time, would you recommend adding around the same time as the chicken? Thanks so much for your great recipes and all of your help in the comments. The quality of my dinners has increased exponentially over the past few weeks! Eric – Great to hear. I think your plan to add 1/2-inch pieces of asparagus in this is good. I don’t think you need to blanch them. Cooking them along with the chicken should work out well. I am liking the pineapple and prawn combo here! Vanilla ice writes words of wisdom! Great shot, making this tomorrow! Made this last night. Absolutely delicious and not difficult if you have pre-measured and got ready before getting into the cooking process. I think this site is fabulously and interesting. One thing with this recipe – we did not put the shrimp (in OZ we call them prawns) into the mix until the very last reheat. That way they stayed plump and crunchy instead of overcooked. This is in accord with your ideas for other prawn recipes – and the way we do it in OZ. Hello, first time to your site, an entertaining interview with Mr M . Its actually a simple recipe and yes I like the combo of shrimp and pineapple too.Try adding some coarsely pounded soaked dried shrimp and I bet it will taste heavenly . Bye.